Yes, I’m going to say again how essential I think understanding the “big picture” of the Bible is. It’s not a collection of disconnected stories and writings that each give us an important principle for living or examples to follow. It’s the story of what God has done and is doing in the world, with the story of redemption woven through every line, from Genesis to Revelation. We have been given a book that is unlike any other book in human history, a book that transcends all human wisdom, all human insight, and all human expertise. We have been given the Word of God, the words of eternal life. And we, all of us, are invited to take up and read these words. There is no substitute for reading the Bible. But some of us may need a little help to read it better. There are lots of books on reading and understanding the Bible, books that offer methods and skills and techniques. This book does some of that. There are also lots of theological books that take a step back from individual biblical passages and step back from individual biblical passages and biblical texts to try to grasp the big picture of what’s happening. This book does a lot of that. And there are books that try to stir our hearts and souls to long for and desire to read the Word of God. This book does that, too. what the Bible does through us. Many tend to read the Bible as if it were reduced to individual pieces of a puzzle, not knowing where those pieces fit in the grand scheme of things. Individual verses from Scripture are intriguing-lots of “color” and unusual shapes. We like to look at these pieces, even for long periods of time. We set them apart, look at them often, and bring them out to show others every once in a while. He explains that sometimes it takes a little work to figure out how the pieces fit. It’s not always readily apparent, so we must keep the grand scheme of creation, fall, redemption, restoration in mind. In the same way, our lives can also be likened to a puzzle. Sometimes individual events or parts of our lives don’t make sense. But, keeping this big picture in mind helps us see how they fit. 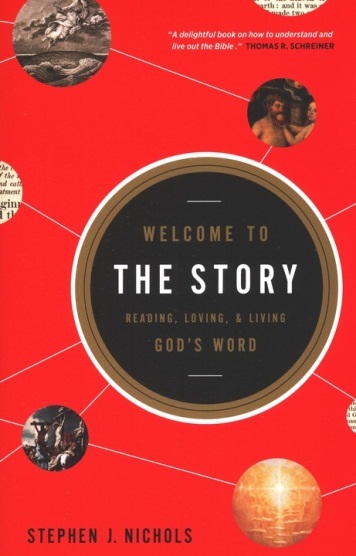 Welcome to the Story does a great job of bringing together a basic understanding of the grand scheme of the Bible’s storyline, practical tools for Bible reading and interpreting, and personal application. It’s great for individual reading or even to use with teens, and I think it would be the perfect resource to give out in a new member or discipleship class. It’s definitely another great tool to have in the family discipleship toolbox! Thank you to Crossway for providing me a copy of the book for review. All opinions are my own.